Top quality education is an essential cornerstone of the Nocatee lifestyle, and access to such educational institutions is greatly valued by Nocatee families. On February 26th, Nocatee will host an informational talk on the Duval County School System in the Nocatee Room at Crosswater Hall. 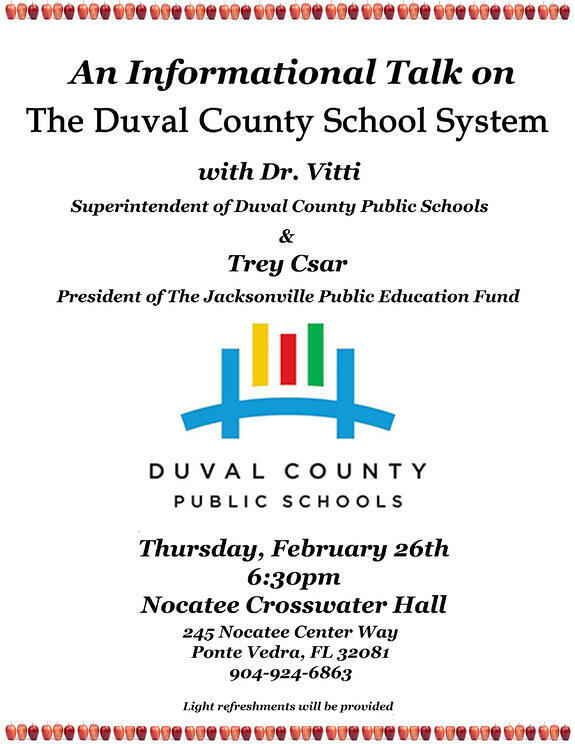 There to present the latest information on the Duval County school system will be County Superintendent, Dr. Vitti, and Trey Csar, President of the Jacksonville Public Education Fund. Jacksonville's Duval County School District continues to create buzz and excitement, receiving the highest test scores in its history and persisting in the implementation of new and innovative magnet school programs. As 15 percent of Nocatee land is located in Duval County (the majority in St. Johns County), some of Nocatee's newest residents will be zoned to attend Duval County schools. No matter where your children are enrolled, be sure you are up-to-date on the latest "Back to School" tips to ensure a smooth and successful school year! To learn more about affordable new homes and communities at Nocatee, stop by the Nocatee Welcome Center or call 1-800-NOCATEE.